To be perfectly honest, I didn’t have high expectations for my visit to Xinjiang’s Heavenly Lake this last weekend. Wonderful experiences at Karakul Lake and Sayram Lake, not to mention the gorgeous Kanas Lake had set the bar high. My fears were unfounded. The primary reason my expectations were so low was because of what I like to call the “curse of the Chinese tourist“. This phenomenon occurs when two factors meet: popularity and accessibility. In short, my theory goes like this: a destination loses its appeal at the point where easy access (i.e. 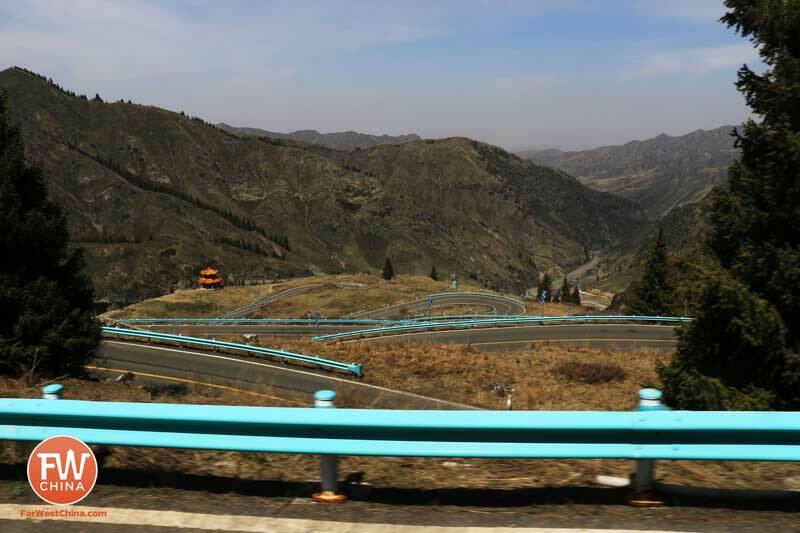 paved roads, comfortable crazy toilets in China, etc.) and mainstream Chinese popularity meet. It is here where you get throngs of tourist destroying what should have been a peaceful vacation experience. I’m spoiled here in Xinjiang, I admit. It’s hard to get away from the masses in eastern China but it’s what I’ve come to love and expect here in western China. But the good news – what I plan on sharing with you below – is that while Heavenly Lake (i.e. 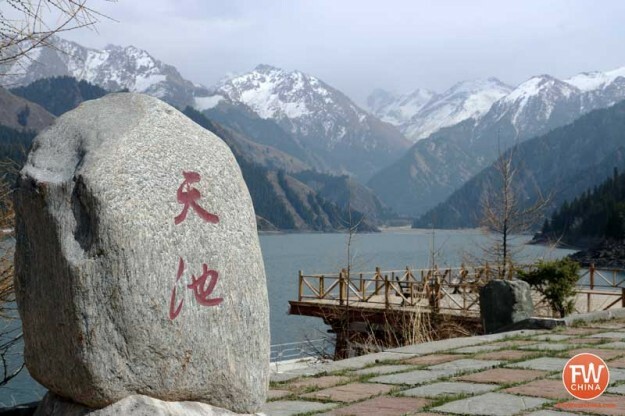 天池 “Tian Chi”) has become one of Xinjiang’s most crowded tourist destinations, with just a little effort it can transform into a haven of solitude and beauty. What I’d like to do is share with you some of my experience, some tips on how you can best enjoy Heavenly Lake, and then I’ll end by provide pricing, practical tips and maps. For most people the journey to Heavenly Lake starts at the gate of Urumqi’s People’s Park. It’s here where the majority of tourists set up their day trip which includes a 2 hour bus ride to the main gate, entrance fee, transportation to the lake (I’ll explain this in a moment) and sometimes a meal. Personally, I rented a car since I had convinced a bunch of friends to join us on the trip. I know it seems crazy, but the longer I live here in China the more I enjoy those rare moments of independence. 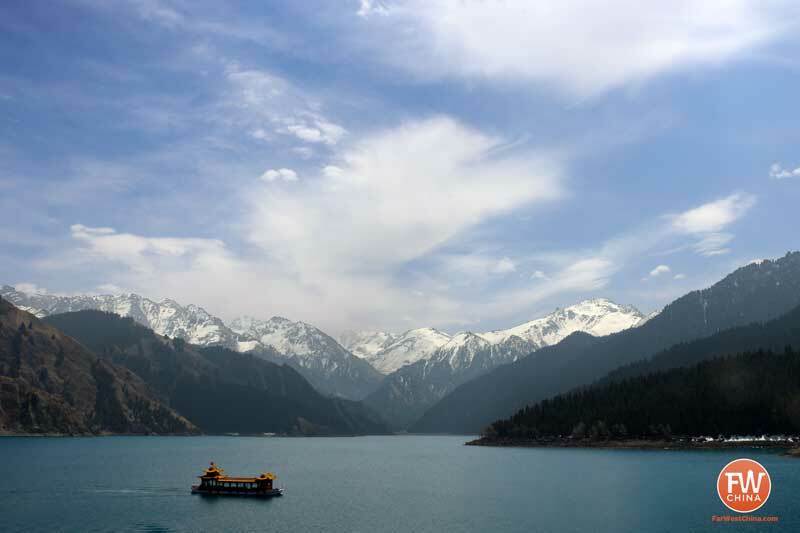 Once we arrived at the main gate of the tourist complex, however, I was forced to park my car and experience Xinjiang’s Heavenly Lake like everybody else does. We began by jumping on a bus – one of what looked like 100 that they had parked there in the parking lot – for a 30 minute drive to Heavenly Lake. With the exception of a dumb tourist trap to check out an “authentic Kazakh village”, the ride was beautiful but mostly uneventful. For those who easily get car-sick, the winding road you see here might cause a few problems, so I advise a window seat. You’ll actually meet quite a few Kazakhs during your trip to Heavenly Lake, which I found to be a lot of fun. Most of them are selling a service and might seem over-bearing at first, but it’s possible to get to know them and have a nice conversation – even one in English. Once you get off the bus you’ll have another kilometer to walk (or take an electric car for 10 RMB) to reach the picturesque Heavenly Lake. It’s incredible how this lake instantly comes into full view at the crest of a hill. All along the north end of the lake you can meander along paved walkways, take pictures next to a big stone that says “天池景区” or board a boat that will give you a tour of the lake (an extra fee). My group of friends had packed a lunch and set up along the grass next to hundreds of other Chinese tourist doing the same. For some people this experience is enough and Heavenly Lake is set up to accommodate you. Sit and enjoy the view and take a bus back whenever you’re done. For those who want a little more adventure, there are paths that can take you all the way around the lake (it’s smaller than it looks in the pictures, trust me) as well as Kazakh families who have set up their yurts for overpriced meals and even an overnight stay. Getting away from the crowds doesn’t require strenuous hiking, though, which might be good news for some of you. In fact, I recommend walking around the lake a bit before setting up your picnic. In my opinion, the views are actually better further down the lake and there aren’t as many people. Once you’re ready, buses leave every 10 minutes or so until 8pm Beijing time to take you back to the main gate. That’s the tourist experience and frankly, it’s not a bad one. 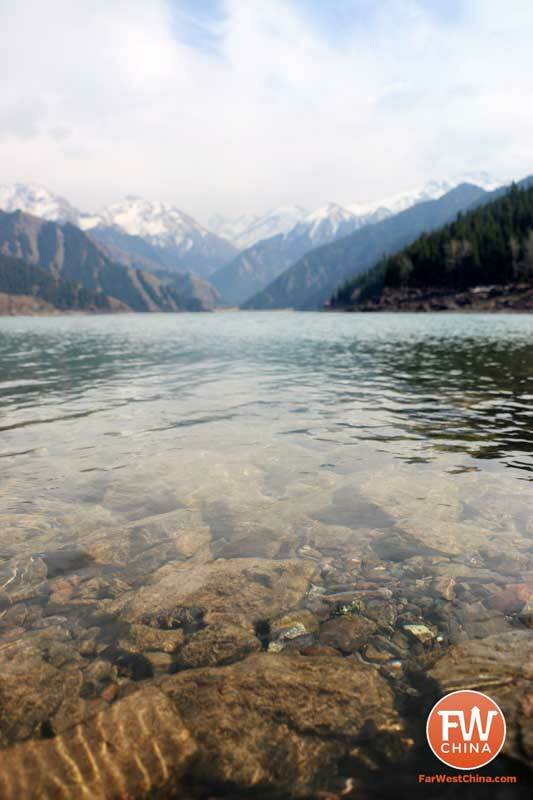 However, for those who enjoy nature and don’t mind working a bit for the experience, Xinjiang’s Heavenly Lake has much more to offer. For the best experience, an overnight stay is a must. Whether that’s a cheap yurt or a tent, either way it’s going to be cheaper (and more fun) to stay on the mountain than in a hotel back in Urumqi. It’s actually possible to start hiking from Urumqi, cross through a valley in the TianShan and arrive at Heavenly Lake, but that goes far beyond the scope of this article. Perhaps I’ll touch on that at a later date. 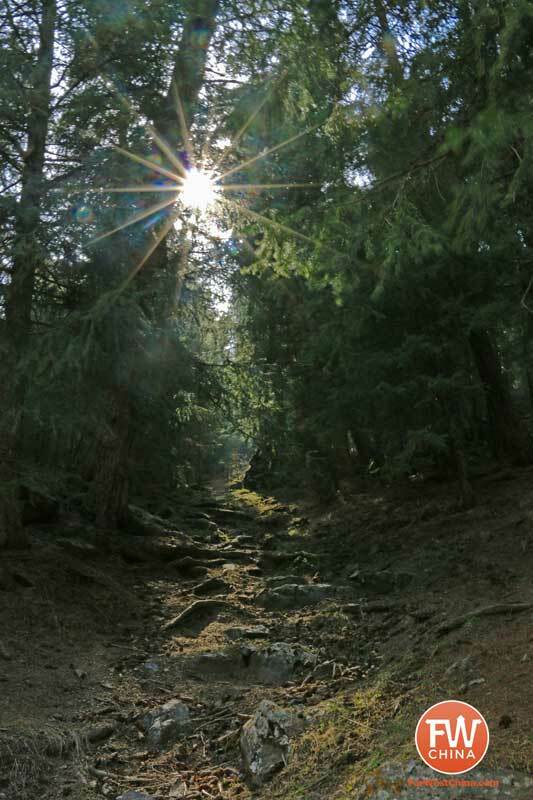 Heavenly Lake offers a good mix of boarded walkway, paths and opportunity to blaze your own trail. 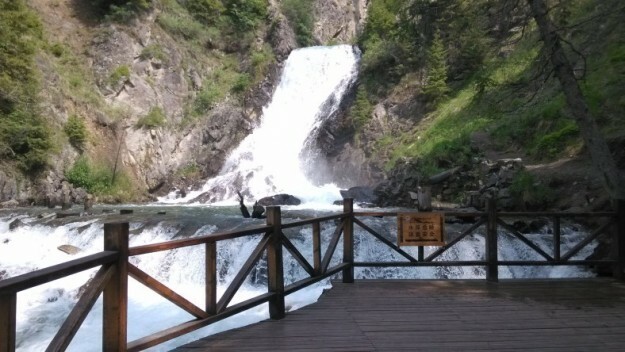 A simple walk toward what is known as “Little Heavenly Lake East” (东小天池) gives you an incredible view of waterfalls, greenery and fresh mountain water. Even for day-trippers this is an easy side trip. Strictly speaking, camping is frowned upon within this “nature preserve”, but the truth is that it’s done quite often. Camping on the banks of the lake will probably get you booted, but if you hike in enough to remain inconspicuous you’ll be fine. Most travelers won’t have access to camping gear, however, which makes the Kazakh yurts an excellent option. From May through October these yurts are available to rent, either for a single “space” (there’s not really a bed, per se) or as a whole. A typical yurt will accommodate 10 people comfortably, so if you’re traveling with a group it’s ideal. Be forewarned – the yurts don’t come with toilets. There are a host of small peaks to be conquered around the lake each providing their own stunning view of the mountain vista. It’s worth noting that the reserve area is known as a home to a variety of animals, including leopards, so take the normal precaution you would with any outdoor adventure. Things quiet down around the lake come 8pm when the last bus leaves with 99% of the tourists. It’s a beautiful experience to stay near Heavenly Lake and if you don’t have time to make it out to Karakul, Kanas or Sayram, I’m happy to say that Heavenly Lake is not a sub-standard alternative. It’s excellent. If going with a tour group, most of these prices will be combined. Off-season prices (Nov-March) are typically about half off. For the purpose of independent travelers everything is listed below a la carte. Bring your own lunch if you’re just going for a day-trip. You can eat at the yurt or the nearby restaurant, but the prices are unbelievably high. Plus, it’s just much more fun to find a secluded place and set up for lunch next to the lake. Don’t forget your passport: this really only applies if you want to stay the night. 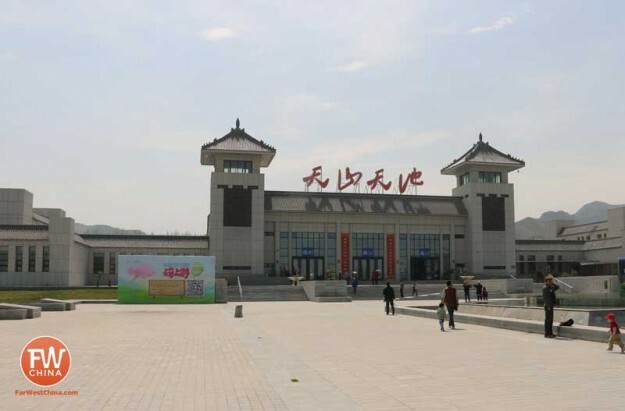 As with any accommodation in Xinjiang, passports are a requirement. Don’t worry about bathrooms: tourism investment in the region has its benefits. The area has clean, western toilets available. Bring plenty of water: this is a no-brainer, but it can be easy to forget when you’re headed to a lake of all places. I really need to check this place out. The pics look awesome, especially the one with the shot of the water and rocks with the mountains in the background. Genius! For real, well done article! Staying in the yurts is ok even without the toilets. Beautiful place. We agree with you in every thing you state regarding Heavenly Lake. Yes, crowds, beauty, lots of stuff for sale. We experienced all of this when we were there in October 2012. Despite what some people may think negatively about the above mentioned factors it is a “Must See” in Western China. One can sit on the side anywhere around the lake and reflect on the tranquil beauty surrounding you. We enjoyed lunch in one of the yurts while experiencing the fine hospitality of the hosts. So true. Thanks for the comment, George! No need to book ahead of time, Carol! Just show up and trust me, they’ll find you :) There are plenty of yurts and travel has been down this season so they’re pretty empty at the moment. HI Josh, thanks for the informative and well written article. We (me and another friend of mine) are in the process of booking tickets and car rental so we can get the hell out of the crowded part of China that will be Autumn holidays. We have found a couple of options for car rental (zuzhe.com and a local one), but are wondering wether we should go for a SUV or normal car. Not planning on crossing any desserts to be honest, at least not off road, but perhaps some unpaved roads are best tackled with SUV – got plenty of driving experience elsewhere in China, but never in Xinjiang. Plan is to have the car for 6 days and drive about 1300km. Any suggestions or thoughts much welcome. In fact I think I will send u a direct mail, and pick your brain a bit if u don’t mind. Hey O. Lee, feel free to drop me a line. If you have the license and budget to rent an SUV, go for it! Most places around Xinjiang are accessible by any old sedan, though. 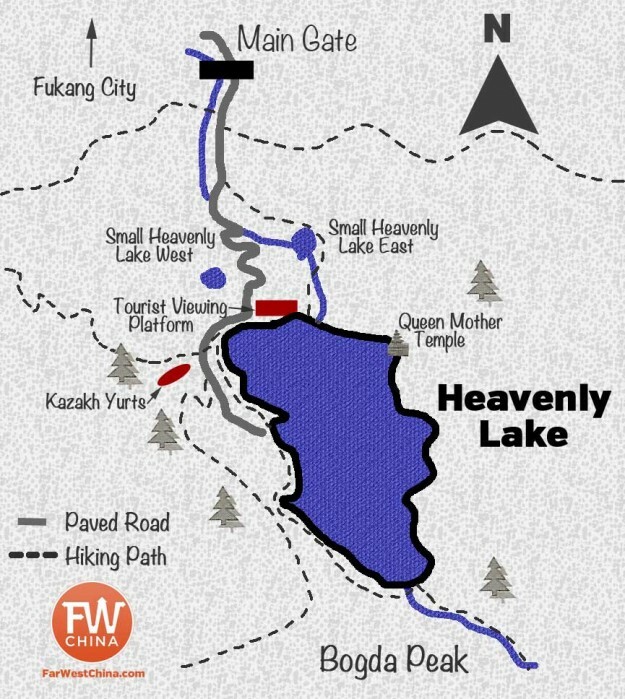 Hi, I’m planning to go to Heavenly Lake on October 28th and 29th. The weather looks like is drops significantly on the 28th. Will the yurts still be around during this time? Glad I have just discovered your website! I am planning to go to Heavenly Lake and sleep there on May 1st, will it still be very cold (I will be travelling with small children) and is it very busy with Chinese tourists at this time of the year so that i have to book a yurt? Hi Amelie! It might be chilly on May 1st but it’s still worth a visit! Just be prepared with a jacket, perhaps. May 1st if a holiday in China, so I would expect quite a few tourists. If you’re wanting to stay the night there are yurts you can book. I have the number for one that you can book ahead of time if you like. Just use my contact page to ask me and I’ll send that along. I would like to go there in Feb. to enjoy the snow and landscapes. Is there a place I can stay in winter? Do you have any contact details? 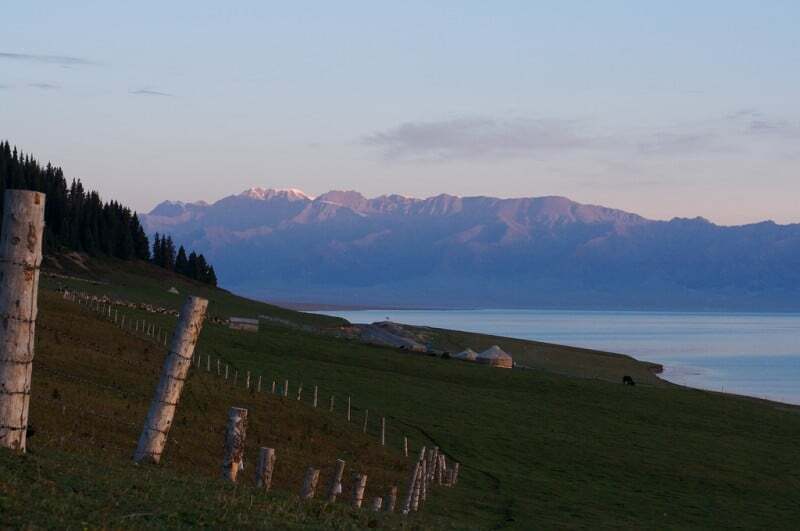 Hi Josh, can you kindly provide some contacts for yurts at Tianchi? Also with the boats, are there small one around that you can charter for a few hours just on your own without sharing with other tourists? AGain, thanks!! Hi, will be arriving in turpan this Wednesday and Urumqi next week and have found your site extremely helpful. Could you provide more detail on arriving to the lake via a trek from the city (you mentioned it above) thanks! Hello, could anyone tell me if the yurts are still open? I mean in november or is it ofseason now? The yurts usually close down for the winter, but you can try to contact somebody while in Urumqi and maybe they can find a yurt or a hotel on the lake that will be open. You never know! This seems like a great place for travel! Just wondering how safe it is considering that I am a female and am looking towards a solo backpacking trip. Great question, Fen. 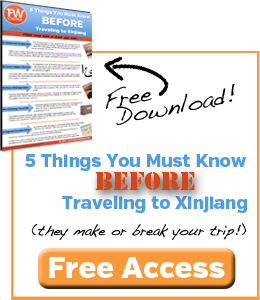 You can find my answer here (including a video to watch): Is it (still) safe to travel to Xinjiang? Thank you for such informative post. We are going to Xinjiang for 2 weeks. Can I private msg you for more info? Thank you! My pleasure, Eileen! You’re welcome to message me, but more than likely I’m going to point you to the bestselling FarWestChina Xinjiang travel guide. It’s the most comprehensive guide to the region that will answer most all of your questions! Great article! Thanks a lot for all the info. We’ll have one full day in Urumqi next week and we are thinking to spend it at Tianchi (flying back home to Shanghai the next day in the afternoon). Since these Yurts wont be available in winter do you think we can walk around the whole lake within one day if we catch the first bus and leave with the last one? guess it will be a bit stressful with the last bus back at 6pm but I thought I’ll check. Thanks again for all the info. Wish I would have found your website earlier. It’s a small lake, so I would think so! Really, though, it depends on your physical abilities. Glad you found the website anyway! Hi Josh, thanks a lot for the article! i’m planning to visit Heavenly Lake at the end of June this year. I think our group will have lunch on the yurt there. How expensive is it? Is it that bad and not worth it? Really appreciate if you could give tips for the yurt lunch. Hi Angie! I wish I could give you an exact figure but it really depends on what you want, the demand while you’re there and how good your negotiating skills are. Since it will be the height of tourist season in June, I would expect to pay 100-200 RMB per person at a yurt, if not more. It’s a rip-off, I know. I will go to Xinjiang in 2 weeks and we would like to book a yurt in Heavenly lake but we don’t find where to book. Do you have a tip for that?